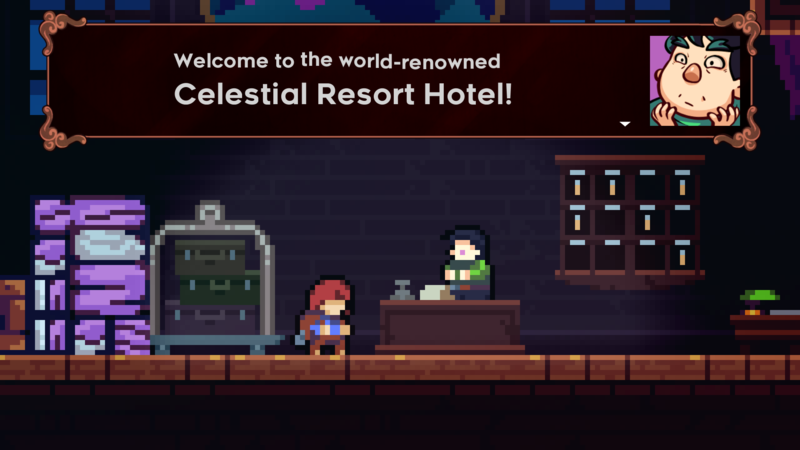 Welcome to the official discussion thread for Celeste on the Switch! To start, please add this game to your log, add it to your collection (if applicable), and (when you are ready) rate it using the link above! So this just came out for Switch and is a pretty fantastic title so far that I haven't really seen anyone talk about here so why not have a thread to bring it to people's attention a bit more? I'm sure that some may pass up on it for now due to being just a Super Meat Boy clone and while it does play similarly, it definitely has a lot more going for it with an involved story, fun characters, creepy and hard hitting themes that I just did not expect. And that soundtrack is so, so good. But back to its gameplay, it's a bit more open in design while still remaining fairly linear but rather than have small set pieces, it's a bigger level with challenge rooms chained together while keeping the exploration aspect for those that want to hunt down for secrets/optional challenges. It never really feels like the game is unfairly hard though and its controls are tight and precise, making overcoming its difficulty a rewarding and fun experience. So check it out if you haven't done so already! And if you have, talk about it here! I will say this, having not really looked at much about the game I have seen SO MANY opinions thrown around that it is astounding. I don't know what the story and such is about, but boy they must have done something because one set of people are praising it as some sort of perfect genius and other sets are saying it's a bunch of pandering BS. I don't know the last time I've seen so many people split on an indie level game. I'm tempted to watch a Let's Play or even just read a summary of the story, just to see why it has so many people talking. For me, I think it's a cool concept, but I'm not a fan of Super Meat Boy style. I just don't have the patience for that anymore. I bet I'd have loved this and the genre as a whole as a kid. Now it's just annoying to me, lol. But I love seeing the creativity of games like this, even if they are a clone that tries some new things. The quality level overall looks fantastic, and I applaud the developer for the hard work! One aside, the little pop-up character icons make me straight-up cry. They are so well made and appealing, and the rest is just pixel-art generic and bland. My imagination races to what could have been if they would have used the Character Image art style on the entire game. I fear if I played I would spend the whole game miserable over such a missed opportunity. EDIT: I really hope the developer and the artist who did those will make something next that takes full advantage of whatever brilliant mind is behind those character boxes! Or maybe I can dig around and find what artist it was and hire them for some future game or something, because I adore those pictures. I've gotta say, I'm not as sold on this as some are (I think the story - while dealing with important themes - is a bit too on-the-nose and takes up too much space, for instance), but it's a really good platformer, and I'm enjoying it a ton. It's one of those games where you don't get too frustrated about failing, and feel appropriately rewarded when you succeed, and I have yet to come across a scenario that feels unfair. I'm hoping to see someone run this on next year's Awesome Games Done Quick. It might not make for as impressive a video as, say, I Wanna Be the Boshy, but then again this relies less on muscle memory so I think I'll appreciate a good run of this even more. The game is actually pretty customizable in terms of difficulty from what I heard. I haven't checked it myself but for those who fear difficult games in this genre, it's still pretty accessible and open. And the visuals are actually pretty nice I think but I guess that depends on where you stand on this style. Seeing everything animated looks gorgeous and smooth. 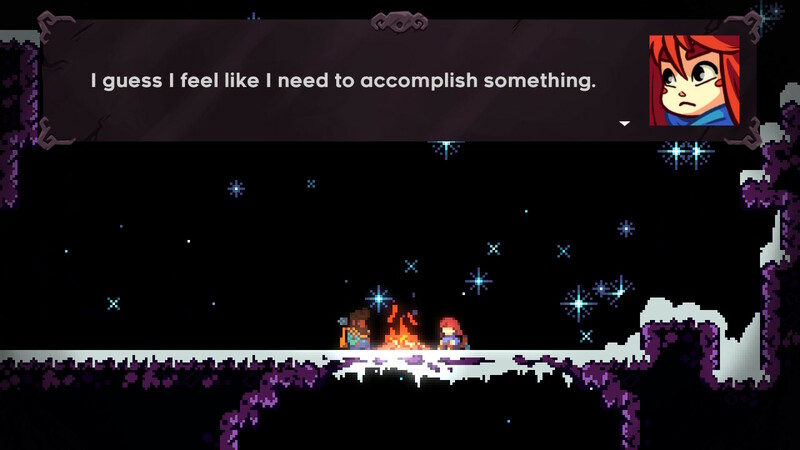 Yeah even when you do fail in this game, it never starts you off further than just before whatever you were attempting to do so while there's tricky platforming, it's very forgiving in letting you immediately reattempt to beat it. I've been having a hard time getting it up for 2D platformers lately--tried both Sonic Mania and Rayman Legends and thought that they were "good! 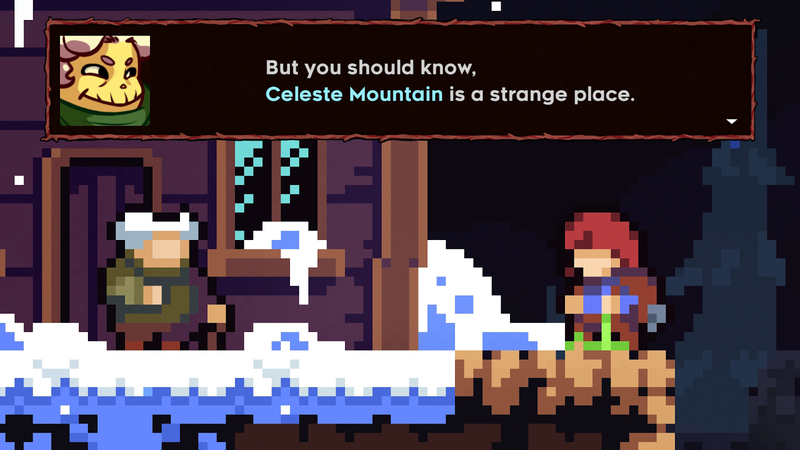 ...that's it"--but Celeste has piqued my curiosity. I haven't heard it compared to Super Meat Boy, but I suppose I can see the comparison if they're both hard single-screen platformers. I hear the game has lots of secrets and kinda cool exploration stuff, so if that's true, I'm in. Haha, I saw that this morning and it's so true. Damn those strawberries! I'm not a huge fan of Super Meat Boy-esque games (I have heard it is like this) AND I bought Slime-San (also compared to Super Meat Boy) earlier in the year and still haven't finished it, but I'm tempted almost exclusively based on how REALLY HIGH the scores for this game have been. 93% between 8 reviews right now. Is it just that good?! Yeah I have really fond memories of playing the Rayman games with the nieces and nephews but playing it alone was just kind of so so. Definitely works best for me as a multiplayer series. I will say that Legends felt like a step up from Origins, which was already good. Posting some of the early songs here, because the soundtrack is really solid. Not as bleepy and bloopy as the graphical style might lead you to believe, but actually rather atmospheric and sweet. Hasn't gotten on my nerves once, not even in places where I've kept dying over and over again. Good job by Lena Raine there. If you're only gonna listen to one of these, give the second one a shot. I like this game, but I don't love it. It's a good, challenging platformer worth the time and money for those who are into games like it. I can't really get on board with the people calling it a 10/10 GOTY candidate, but eh... glad they are enjoying it that much. I do like how they handled the strawberries by making them completely useless outside of the satisfaction you get out of completing a difficult challenge. This allows me to pass on some of the ones I'm just not having fun trying to get without feeling like I'll be punished for it later by not being able to unlock something. Currently on World 7 and loving my time with it. Think its a bit of a shame its being compared to Super Meat Boy so much, when Matt Thorson did the whole 'red cube in a hard platformer' shtick years before Meat Boy was a thing. The game looks, feels, and sounds great, and is just bursting with so much life and energy. Been trying to complete as much as possible and finding it incredibly rewarding to do so just because of how satisfying succeeding feels. They do a lot with the portraits as well. They can sometimes break out of their little box and the react to what is happening to the character as well. Its great stuff. I disagree with you on the general look of the game though, I think it looks fantastic. Lena is a fantastic composer. She did a bunch of work for Guild Wars 2 before this and some of the tracks there are amazing. Really hope she gets even more attention for this. Oh I don't disagree with you about the quality of the art, certainly! It looks fantastic for a pixel art game, which the market is now absolutely flooded with. I'm just personally super tired of the flood. Definitely not claiming it looks bad for what it is, only that I'm ready to move on from this style fad. It has overstayed it's welcome for me by about "many-years" now. Time to evolve to new things. I enjoyed all the Monkey Island 1 and 2s. Ready for an industry of Monkey Island 3s. One of the most beautiful games ever made, crammed between pixel art and 3D models. An era that ended far too quickly. EDIT: Well, great. Now I want to go play Monkey Island 3, darn it. This is why I can't ever look at any images from that game. Unpopular opinion incoming! I'm not really a fan of the trance-style music that it's in a lot of indie games. Where a baseline is established that starts off interesting, but then the song just kind of uses the same chords over and over, layering in more instruments. It's not really my style of music; it tends to set a good atmosphere but there's not a strong melody like in my favorite game music. I have far more difficulty recalling and humming music from a bunch of recent indie games than I do something more melody-driven. Granted, I say all this only having listened to the tracks posted in this thread. But I had a similar issue with Runner2's soundtrack. Just play it on PC! It's the proper way to experience the game! How about this awesome indie game soundtrack I just uh... randomly uh... stumbled upon? I keep trying to get into Rayman Legends, but it never grabs me. I think it's the controls. And the oddly forgiving/punishing medal system. I hate the idea of purple lums. They're so valuable and finicky that they kill my flow. Especially in the floating sections. Which aren't even fun in the first place. As if this game wasn't floaty enough! I LOVE the Castle Rock level. If the entire game was highly-polished unique musical levels set to licensed songs, oh man, best game ever. I didn't finish it on Wii U yet found myself buying it again on Switch when it went on sale for $20 the other day... so attempt 2! Man, I have a problem. Oh well, it's better than heroin or gambling.